I took my Poured Out 2 quilt with me to a quilt guilt meeting. They clapped when I showed it. I blushed like crazy. Always do. This quilt was a triumph and a disaster. It helped me express myself during a difficult time, but then the sucker bearded like crazy. Such a disappointment. But the contrast of the turquoise thread on the black back always makes me smile. May your quilting make you smile today too! Hey Amy, what kind of batting had you used? Regular quilting cotton? Did it beard from daily use or washing lots? I am very interested. No washing, just a gentle water bath for blocking. It's got two batts, one poly, the other wool. Both white. Should have ditched the poly and also used black batting. Makes me smile, too! 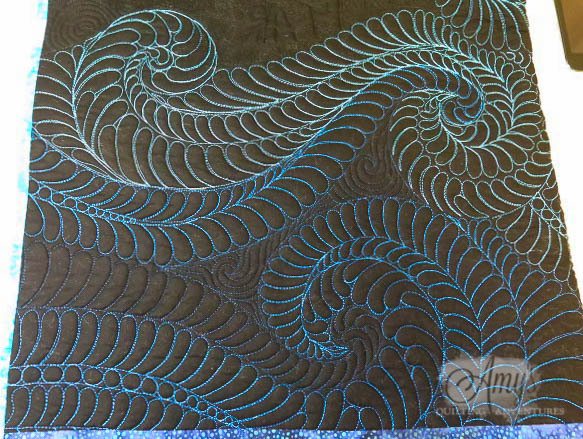 Beautiful feathers--I never get tired of quilting feathers! I can't remember the last time I quilted feathers. :( Been too long. Hi Amy, Beautiful work (as always). I was wondering about the bearding on your quilt. I too had that happen on a black backing. I wish I would have used black batting but I still am not sure why the bearding happened at all. Do you know why it happened on your quilt? I definitely should have used a black batting. I think it looks worse than it is because of the color contrast. Both battings I used came with good recommendations, but both seem to have bearded. I blame the poly and will never use it again.